Healthier than fried, these chunky wedges are a true delight and perfect for busy weeknight meals. They're so good, they taste like what you'd get from a restaurant. 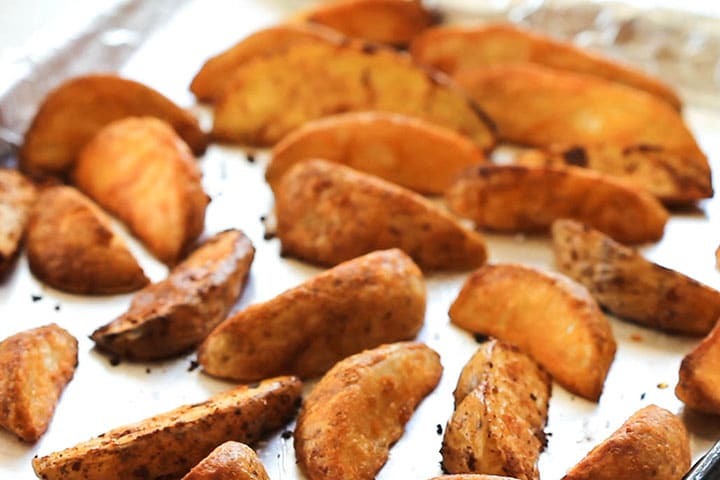 This super simple recipe for Seasoned Baked Potato Wedges is great for fussy kids. 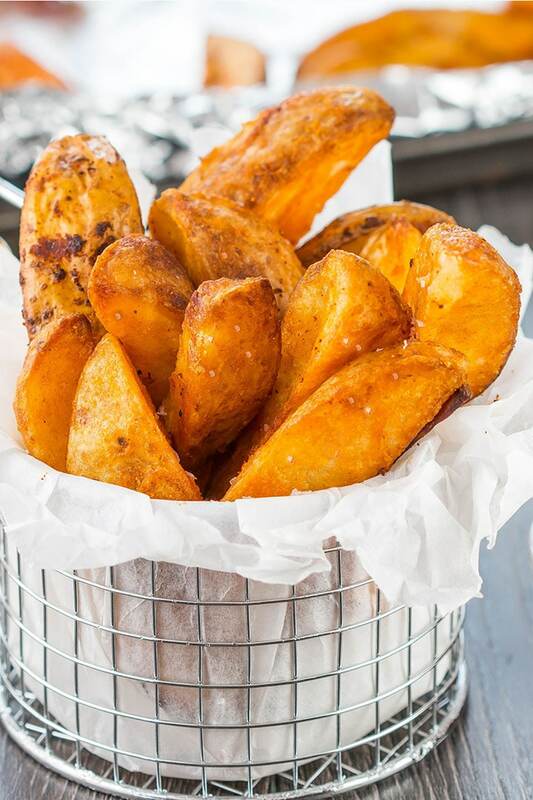 It turns an ordinary potato into delicious homemade wedges. What’s your go-to side dish? In this house, we love potatoes. Mashed – roasted – baked – we love them and this recipe is one of our favorites! 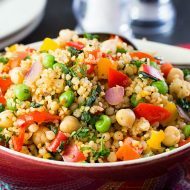 This recipe is perfect for busy weeknights because it’s so quick and easy to prepare and they taste like what you get from restaurants and pubs even though this is made in the oven and not deep fried. And at just 165 calories for a big satisfying helping – what more could you want? Roasting the potatoes at a high heat makes the potato wedges soft and fluffy on the inside and crunchy on the outside. 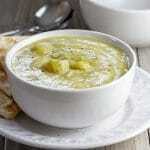 The combination of spices adds a kick of flavor without the hassle of chopping garlic and onions. Using low-fat cooking spray makes them less oily in taste and much healthier. The flavors used makes them a versatile side dish that works with anything from fish to steak. Start by washing the potatoes to get rid of any dirt (there’s no need to peel them). Then cut each potato in half lengthwise, cut each half into 2-4 wedges (depending on size) so that you end up with 6-8 wedges from each potato. 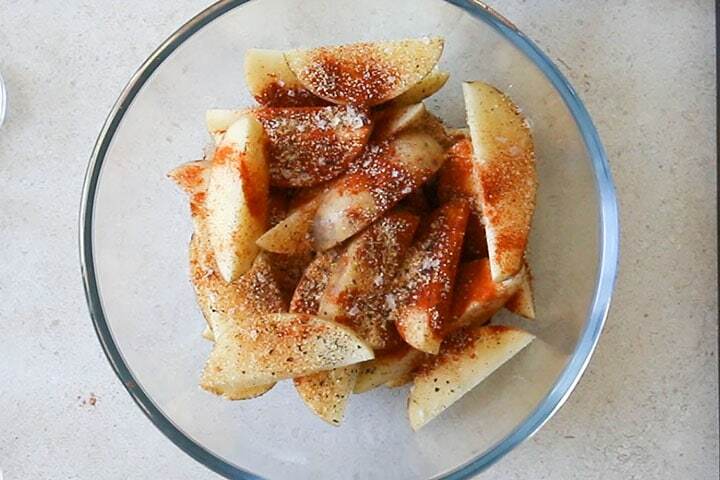 Add the wedges to a large mixing bowl, sprinkle with paprika, garlic powder, onion powder, salt, and pepper. 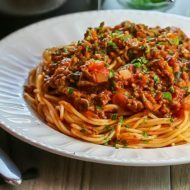 Drizzle with about two tablespoons olive oil (or spray with low-fat cooking spray}, and then toss everything together to coat. 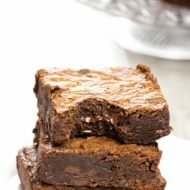 Place on a baking tray lined with nonstick foil.Spraywithextracookingsprayifneeded. Serve fresh out of the oven and enjoy! Love potatoes? Why not try my recipe for Crispy Garlic Potato Roast, it’s super simple and packed full of flavor! 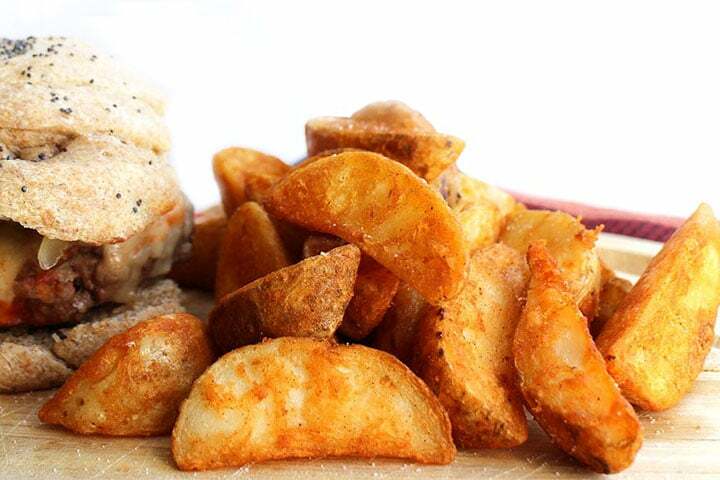 For fluffy wedges, use a waxy potato like Red potatoes, or Yukon Gold (although Russets will work too). Be sure to scrub the potatoes well as potatoes are not cleaned before being stocked at the grocery store. 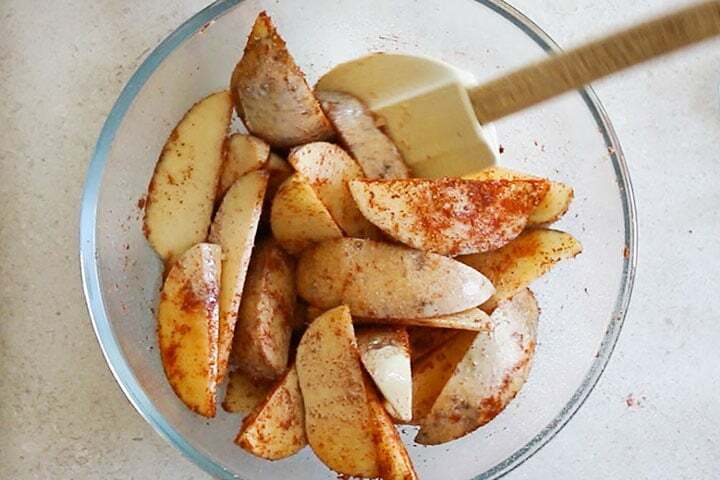 Try mixing all the seasoning and spices in a Ziploc bag and then use it to toss the wedges in. It’s easier and gives good coverage. Short on time? Cooking time can be reduced if you cut the wedges thinner. Soak the potatoes in ice water: If you have the time, once sliced, soak them for 30 minutes to remove some of the starch in the potatoes. This allows the wedges to crisp up a little more than they would otherwise. Dry your wedges thoroughly: Even if you don’t soak the wedges, once sliced, lay the wedges out on paper towels, cover with more paper towels and press down to dry them completely. The dryer the better. Line a baking sheet with non-stick aluminum foil. The surface of non-stick foil allows the potatoes to brown without sticking and burning. Don’t overcrowd the pan and be sure one of the flat sides is touching the foil. 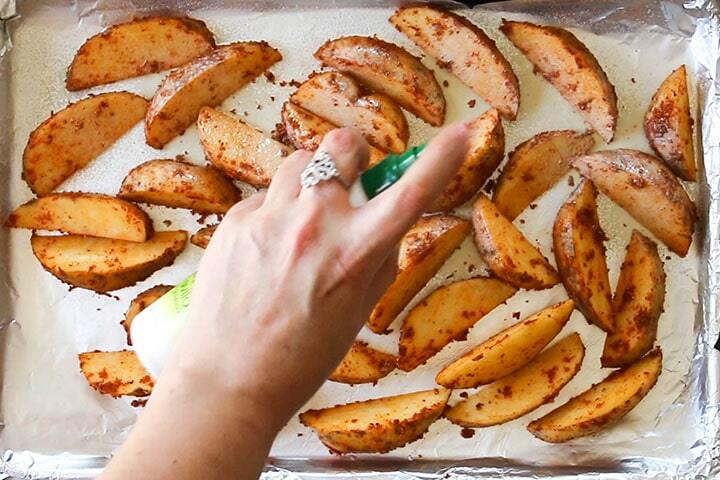 For an extra crispy finish, turn the wedges halfway through baking. 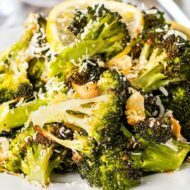 For an extra kick of flavor, try omitting the garlic powder and adding fresh minced garlic, and grated Parmesan cheese and fresh herbs of your choice. For a spicy hit, try adding cayenne pepper or crushed red pepper or red pepper flakes to the seasoning. I’m often asked if these Baked Potato Wedges can be reheated. Although I’ve been told you can, my opinion is that they just don’t hold up as leftovers. 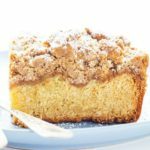 I have a soft spot for this recipe and would really love to know what you think if you try it. 🙂 And I’d love to know what YOUR potato wedge secrets are!! Do you have a secret ingredient or technique for your famous wedges? Please share in the comments section below! Wash the potatoes to get rid of any dirt (there's no need to peel them). 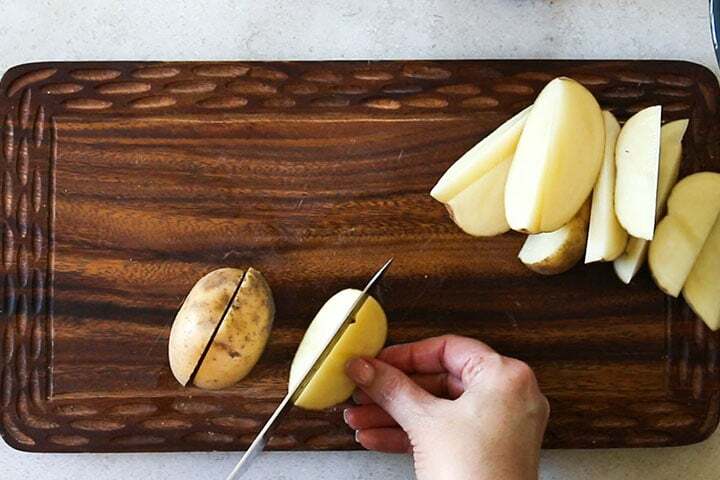 Cut each potato in half lengthwise, then cut each half into 2-4 wedges (depending on size. so that you end up with 6-8 wedges for each potato. Add the wedges to a large mixing bowl. 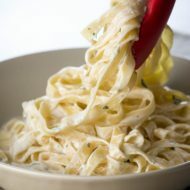 Spray with low-fat cooking spray (or If using olive oil, drizzle with about two tablespoons olive oil) then toss everything together to coat. Season well with salt and pepper. 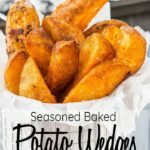 Spread the wedges in a single layer over a large baking sheet lined with nonstick foil and bake for 35 to 40 minutes, or until golden and cooked through. 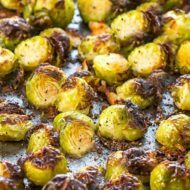 Remove from the oven and while they are still hot, season with salt to taste. The nutrition information is reflecting low-fat cooking spray. Using olive oil will result in higher calories. When using cooking spray - For extra-crisp wedges, 1/2 way through the cooking time, spray again with the cooking spray and return to the oven. 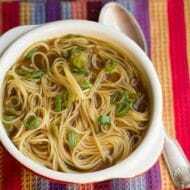 This recipe was originally posted in May of 2014, but was republished with step by step photos as well as nutritional information and video. 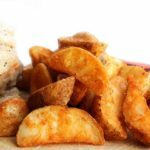 When I made these for the first time to shoot these wedges, I used low fat cooking spray instead of olive oil. Soon after, I started getting emails and comments from people saying that although they really enjoyed the recipe, their version didn’t look like mine. 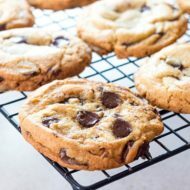 whether you make them with cooking spray or oil, they taste great, but they may look slightly different than the photos. Had these with oven fried fish ….they were yummy! Made some Copycat Red Lobster biscuits..omg..we devoured it all. Thanks for the recipe!! Will use it again!!! Planning on cooking these with turkey burgers tonight, but to cook both on the same pan, at the same time, I’m going to have to compromise. I’m thinking about 375 or 385 and maybe go an extra five or 10 minutes and keeping an eye on the turkey patties so they don’t get done too soon. If they do, I’ll take them out and jack up the heat a few minutes on the potatoes. That sound’s like a good idea, touch base when you’re done! I made this yesterday and it was quite good. I did add some shredded cheese during the last few minutes of baking and finished it with lovely bacon bits. Wow, Dave! That does sound delicious, I’m glad you enjoyed them! I would put some parmesan cheese on last few mins. How about using seasoning salt too? Because I’m thinking of trying this out but I don’t have the right spices and don’t really wanna use the garlic powder or onion powder. But doesn’t hurt to try something different. I bet celery salt would be good on these potatoes. I use alit of celery salt when I season meats and veggies. Sounds good April thank you for your feedback! 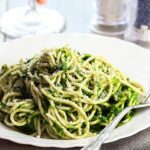 What can you use instead of onion powder ? 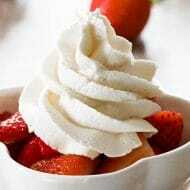 Or will they be still taste good with out it ? sorry for the late reply, you can leave it out if you are not keen! I bake my potatoes about 3/4 of the way done, first. I let em cool, then slice thick, coat, then put them under the broiler to brown. Cooking first helps them dry out and brown better. It takes longer, but i cook potatoes ahead of time, like when im making dinner the day before.